As December 6th approaches, many American children happily await jolly old St. Nicholas, leaving their shoes or stockings out in anticipation of the candy and gifts they will receive. It is a sort of pre-Christmas, a day filled with laughter and joy. 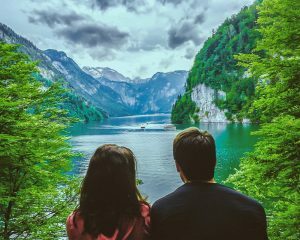 In Austria, however, things are a little different. In Austria, St. Nicholas does not come alone. 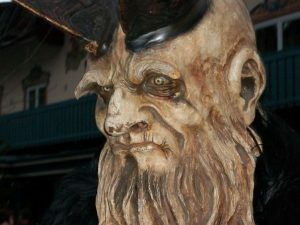 Accompanying him is his shadowy companion – the Krampus. What is Krampus, you innocently ask? I’m not sure if you want to know the answer. Imagine a horned, furry alpine monster, wielding a birch whip in its monstrous claws. Terrifying cow bells adorn this nightmarish creature, serving to warn you of its imminent approach. Its job? To punish or take away children who have misbehaved. 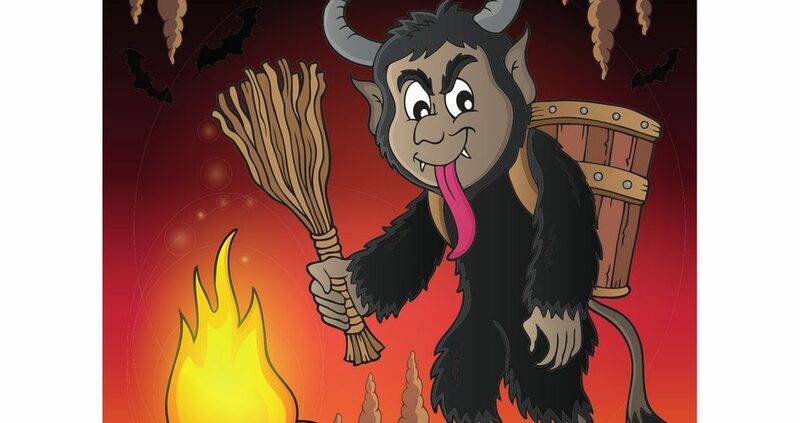 Some Krampus, in fact, sport a large basket (big enough for a small human) on their backs – for that very purpose. 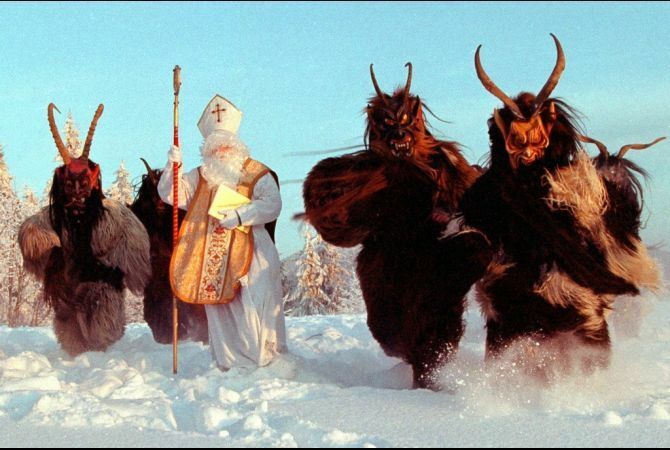 When Austrian children are little, St. Nick and Krampus will actually come to their house, and St. Nicholas reads the child’s good deeds and bad deeds from his all-knowing book of children’s behavior. If a child, say, has shared his toys with his cousin, St. Nick will smile at the good little girl or boy and read this kind act out loud. But if the child has recently given his little brother a good kick in the shin, St. Nick will read this out loud, too – a signal for the horned Krampus to flick his whip at the child threateningly. When my Austrian husband was a little boy, he used to live across the street from a barn. His neighbor told him that a Krampus lived in the hayloft of that barn – which scared my husband so much that he always had to sprint past the barn to get home, even in July. I’ll take a lump of coal in my stocking any day! The Krampus start to appear in the streets of Austrian cities a few weeks leading up to St. Nicholas Day. My third year in Austria, I was walking in the old town of Salzburg at the end of November. All of the sudden, I heard a bell jingle, and a burst of fear shot through my body. I couldn’t put my finger on why a bell would scare me, until I turned the corner – only to be confronted with three giant Krampus! Talk about a Pavlovian response. I made an abrupt about face and decided to take a new route home. 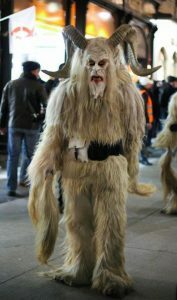 This “little” Krampus approached my friend and I our first year in Austria. He looked at me, slowly turned and looked at my friend, and then looked at me again – and then whipped me on the leg! 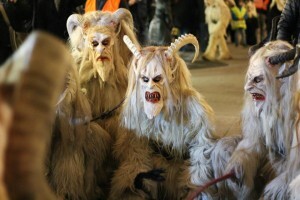 December 5th, St. Nicholas Day Eve, is the Krampus’ big day. On this night, there are hundreds of “Krampusläufe”, or Krampus Parades, throughout the entire country. 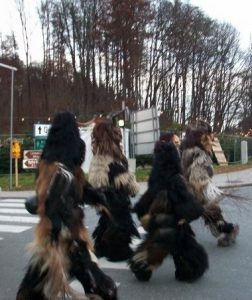 Multitudes of teenage boys, members of “Krampus Clubs”, dress in their hideous horned masks, matted fur, cow bells and whips. They then charge through the streets of cities, jumping, chasing and even hitting the strangely excited, sometimes terrified onlookers. If you run away, they see it as a challenge, racing after you with their bells jingling menacingly until they have successfully whipped one of your legs. Bruises are not uncommon. Neither is “girl-napping” – I once had a particularly short friend get picked up by a Krampus and thrown over its shoulder, only to be dropped off somewhere else in the (luckily small) city. For my part, now that I don’t live in Austria anymore, I make it a point to visit my in-laws any other time but the end of November/beginning of December. I grew up with fairies and sugar plums, after all! 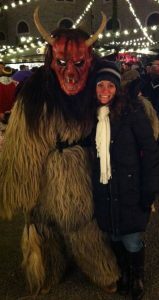 My last year in Austria, I finally got brave enough to take a picture with a Krampus – but I did get whipped on the legs afterward!